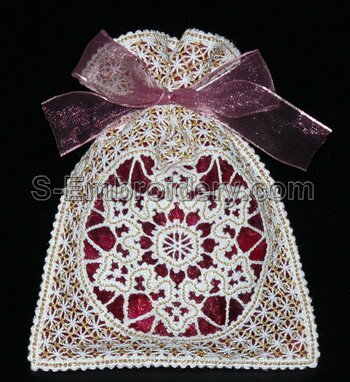 The free standing lace Christmas gift bag set includes 5 machine embroidery designs in Battenberg lace technique. 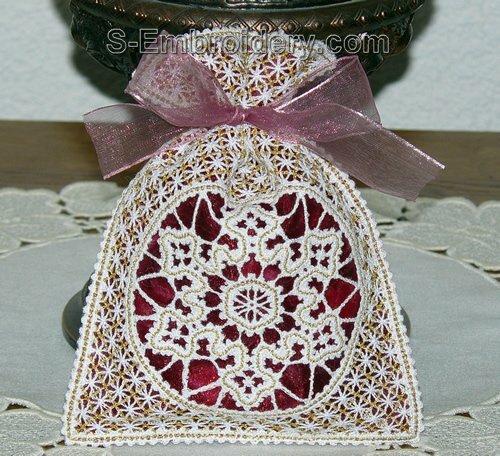 With this embroidery set you will create a minimum of 5 nice freestanding lace gift bags with a snowflake ornament on one side an a plain panel on the other. You can use the designs in any combination you like, so you can yet more different Christmas gift bags (e.g. with a different snowflake ornament on each side or with no ornaments at all). For the gift bag featured on our web site you will need some organza but you could choose to create your gift bags without any fabric, just using the freestanding lace embroideries from the set. You receive 6 machine embroidery designs in one of the supported formats and 2 PDF files with design information and instructions for creating the gift bag. The size of the Christmas bag side panels is approximately 5 x 7 inches (129 x 179 mm). The number of stitches varies between 38,923 and 49,712.